Bamboo Hideaway is truly a hidden gem.. It is located on a quiet, former Hawaiian Homestead acre next to the Wailuku River and its falls. your stopover in Hilo town. CDs and a Hawaiiana library is also on hand. incredible shower massage!! Ah.h... The vessel sink sits atop a quartz countertop . The quartz countertops are also found in the kitchen. There is a wonderful new Caspar *TM queen bed with all cotton sheets . In the same bedroom sits a queen size pull out sofa futon with coil spring core. This rental does accommodate children over 10 years of age. The kitchen supplies all new electric appliances that are necessary for the chef of the house. ceiling fans as well as many windows for cross ventilation and cooling. The living room has two love seats and side tables. needed. Wander the premises and find fruit trees and plumerias with orchids blooming in them. probably provide you with anything you might need if you don't see it at Bamboo Hideaway. Recently in early 2017 we added a nearby washer and dryer. This is free to use during the day on a limited basis. Please ask us about it if needed. Its hard to believe you can be in this peaceful rural setting, yet in 5 minutes you can walk down into Hilo Bayfront stores and restaurants or the local Farmers Market. A few minutes of a drive will take you to the new Imiloa Astronomy Center, the Univ. 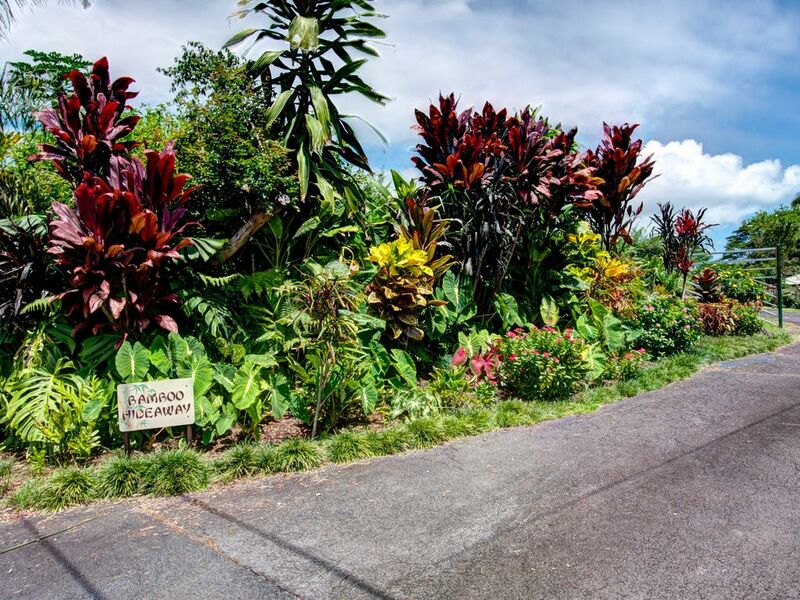 of Hilo, the Botanical Gardens and the zoo which is a botanical garden as well and numerous other attractions that need to go on your must see list. experiencing this phenomena. If it is flowing into the ocean out of Pu uoa vent, we highly recommend the lava boat tours out of Pohoiki for sunset and sunrise tours. is here for you to discover its Big Heart filled with Big Aloha !! I was born and raised a San Francisco girl but at the height of the 60's started traveling which led to a nomadic lifestyle for many years . In the 80's I went north and rooted in Alaska. There I met my future husband to be, Phil. Phil is from Indiana and taught in the alternative public school in Anchorage. I opened up a Holistic Health Center which catered to clients seeking alternative health care. We lived there for 17 years before deciding we wanted to retire in warmth and fresh air. Hawaii was perfect for us because Hilo offered the pace and friendliness that Alaska had for us. We 1st moved to Kehena Beach in lower Puna closer to the lava action. There we had a vacation rental for 15 years and found that we really liked interacting with the guests that came to visit. Many guests became friends and quite a few of them over the years moved to Hawaii themselves. We recently moved in 2014 to Hilo into our home that was a vacation rental for 6 years. 2 years ago we acquired the neighboring land and duplexes which were all part of a large homestead. Instead of long term rentals we decided Hilo could use some more short term vacation rentals. We can start meeting our happy vacationers again. Phil use to teach Hawaiian Studies courses and has written a book, "A Concise History of the Hawaiian Islands", and would be happy to answer any questions about the islands history that you might have. The first time we drove up Amauulu Rd. quite a few years ago , it was like we couldn't believe how country it felt yet we were near downtown. A few years later, a realtor friend showed us a house on this street that she thought we would like even though we were only looking for land. Well, that did it. We fell in love with the area, the pastureland behind us and orchards across the street with the river 300 yards away. Sort of wild but in the city. The house itself was perfect so no need to build one and it was fairly new. We bought it the next day. Then, 2 years ago, the neighboring piece of land along our driveway became available and it had 2 longtime duplexes on it. We acquired that to protect our assets. These duplexes are perfect for the vacationing couple who want quiet beauty yet convenience to walking into town to dine at night if they desire. It doesn't get much better. You also have the opportunity to pick fresh fruit from our many fruit trees on the 1+ acre lot. Depending on the time of year you can choose from Lychee, Mango, Orange, Tangerine, Longon, Avocado, Tangelo, Papaya, Yabotacaba, and Pineapple. Location, location, location is what made us move here in the first place and this rental is in a perfect area. Tiled shower with massage jets on shower panel as well as rain tree shower head. Vessel sink on Quartz countertop with high end fixtures. Hilo's quaint downtown is just 3 blocks away. It is home to many excellent restaurants, art galleries, parks, and it's famous Farmers Market. On a clear day Mauna Kea is visible from the yard. All high thread count cotton sheets, pillow cases, towels, and wash cloths. Drip coffee maker with a 2 day supply of coffee beans with grinder, filters, sugar, sugar substitute, and assorted teas. All eating and cooking utensils and glassware provided with a service of 6. Dining table with 4 chairs. Full kitchen with full size refrigerator/freezer, electric range and oven and over the range microwave. 42" wall mounted flat screen with sound bar. Good music selection on Direct TV which has a sound bar for excellent sound. 1 1/2 acre lot with landscaping and many producing fruit trees. Kayak rentals are available on nearby Hilo Bay. The back of open car port has picnic table for outdoor dining. There is a par 3 course at the Naniloa Hotel on Hilo Bay as well as an 18 hole Municipal golf course with very reasonable greens fees. Most people are surprised to learn that Hilo is the second largest city in the state as it has the feel of a small town. It was developed as the center of the island's former sugar cane industry and has the feel of the early days of the 20th century when it expanded rapidly. The apartment was very nice, clean, and appeared to have been recently updated. Large bedroom with comfortable bed, nice bathroom and kitchen. The location is quiet and secluded at edge of downtown Hilo. Property is very attractive. The only negative was living room furniture consisted of only two very small, uncomfortable love seats and had a very strong musty smell coming from somewhere. Everything appeared clean and there was no visible mold. smell anything. So I can not really remedy anything I can't find. Hilo is notorious for mold so I usually go out of my way to control it. Comfortable and spacious. Quiet neighborhood, accommodating host. yet so private inside, was the best. Everything I needed, down to a clean, new sponge was there. most unique nightlights I have ever seen. I would unreservedly recommend this lovely place. I used the water right from the faucets with no problem at all. The wi-fi worked well and the Direct TV gave me many viewing choices. I can see that a great deal of thought and love went into this place. Updated kitchen and bathroom were both very nice. Would suggest adding an iron and ironing board. Everything we needed and walking distance to everything in town. Bamboo Hideaway is roomy and very comfortable, easy walking distance from downtown Hilo. Diane invited us to pick oranges on the property— delicious! Comfortable bed, well appointed kitchen. We’ll definitely come back next time we visit Hilo. Bamboo Hideaway is within walking distance of downtown Hilo. Just cross the small Wailuku River bridge and within minutes you will be strolling past bay front shops, galleries, and restaurants. Also close at hand is the public library, Lyman Museum, Tsunami museum, and the Imiloa Astronomy Center . The University of Hawaii at Hilo has student based activities as well. The ever popular Hilo Farmers Market is in full swing on on Wednesday and Saturday with some vendors being present daily. The artsy restored Palace Theater is a movie house with many concerts and cultural events as well as international art films. Sidewalk cafes give you the opportunity to sample many of the world famous Big Island coffees. Hilo town is one of those small quirky yet friendly towns where you can just stroll around and get caught up in the strong feeling of Aloha. Folks are friendly and enjoy taking the time to talk story.